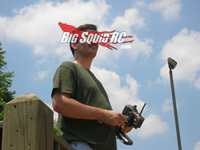 THE Cub Report- 08.08.2011- Alive and Kick’n « Big Squid RC – RC Car and Truck News, Reviews, Videos, and More! As DJ Lance Rock likes to say “Hello friends!”, and welcome to more anarchy right here on BSRC. Everyone at the track today just had to ask me, “How was the RC Car Action Magazine RCX show?”. Well… I got to the party late (hitting the doors about 3 pm) so I hear I missed the big crowds. Brian said the crowds from show open till 3’ish were pretty good, but when I got there things were quite slow, slow enough that the organizers pulled the plug and asked exhibitors to start tearing down their booths at 6 pm, even though the show was supposed to go until 8. So… was RCX Chi-town a failure or a success? For a first effort in Chicago it sounded like RCX did ok. The venue was filled with exhibitors and demonstration tracks (which is good of course), an uber pro full scale drift guy put on insanely cool demo’s out in the parking lot (from what I am told), and a good chunk of especially fervent Chicago hobbyists paid the $30 (between parking and ticket) to get in. Will there be another one? That depends on who you talk to, but there seems to be more yes than no talk of another RCX in Chicago. Personally (like anyone cares, LOL) I had a great time for the 45 minutes I was in the Odeum on Saturday. The try-me tracks all seemed busy, Traxxas/Horizon/HPI had big booths, and the consumers I saw walking around all seemed to be wearing big smiles. But hey, I’m generally extremely positive of any event that gathers a bunch of rc junkies together, so I’m giving it a thumbs up. The second most asked question I got today was, “What did you see that was new?”. Well… props have to go out to Brain, Tim and Evan for providing arguably the most uber coverage of an rc show ever, so you as a reader of our site should already know what was new. For those of you that might have missed our extensive coverage I’ll give you a CliffsNotes. The biggest news had to be Peter V over at Traxxas showing us one of their new Lithium battery packs. According to Traxxas their new packs are a great blend of performance and value, oh and I think I heard something about a one year warranty. We heard a couple different release dates for their new Lipos, but look for them Very soon. Perhaps the second biggest news of the show was Helion showing off their new 18th scale truggy. No, 18th scale isn’t the hottest class now days but Helion just doubled their product line-up, and from what we were told by Mike Gillette, they have a lot more new product coming down the pike. Under the hood of the Helion 18TR it looks much like their Animus, but sadly we didn’t get a chance to drive it. Another “new” item I saw at the show was a very esoteric 4wd short course truck from Speed Passion. Their new Ananta truck was loaded from nose to tail with carbon fiber and generally looked extremely high end. Cubby must have one sitting in my little rc garage, yes, it is that trick. One more note about Speed Passion– as we walked by the Al’s Hobby booth we noticed they were selling the Speed Passion RS2 for $99. What is an RS2? It’s a RTR 10th scale stadium truck that is not only 2.4 GHz but also brushless! Oh and… they have a touring car version (called the RS1) at the same price point! Being the inquisitive types we are, we (of course) procured both vehicles for testing. So… if you are wondering just how good can a 2.4 GHz brushless truck be at $99 you are about to find out this Tuesday when we post our review of the Speed Passion RS2. Brain reported to me that our Bash-A-Palooza event was very warmly received by not only the competitors, but also by the viewing public and show staff. I mean, how could anyone not like guys having fun hucking their rc trucks into a big pile of brand new transmitters or 10 trucks slamming into each other during a match of full contact demo derby? Bash-A-Palooza proves that bashing is indeed alive and kick’n, as well as being an integral part of our hobby. That’s it for this week, support your local hobby shops, tracks and bash spots!